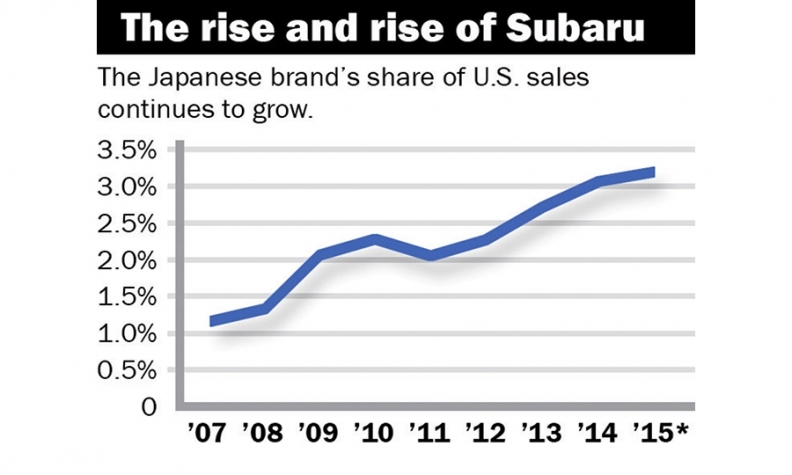 It's true, we look for any excuse to marvel over Subaru's seven years of good luck, the sales surge that began in 2009 for the Japanese brand. Our pretext this time? Hey, it's the midway point in 2015, and Subaru is still soaring -- up 14 percent in a market that increased just 4.4 percent. Here are a couple of new Subaru milestones worth noting. In the first half, its U.S. market share hit 3.2 percent. That means the brand's share has risen by a whopping 2 percentage points since 2007, when its slice of the American pie was 1.2 percent. Only Nissan added more share in that period -- 2.1 points. But Nissan also sells 21/2 times as many vehicles as Subaru. And here's another milestone in the making. This year, Subaru likely will triple its volume total from 2007, when it sold 187,208 vehicles. If, in the second half of 2015, Subaru matches its first-half total, it will finish with sales of about 545,000. But it should do even better. Last year, 54 percent of Subaru's 513,693 U.S. sales occurred in the second half of the year.